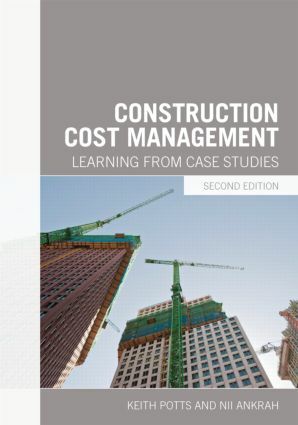 In this updated and expanded second edition, Keith Potts and Nii Ankrah examine key issues in construction cost management across the building and civil engineering sectors, both in the UK and overseas. Best practice from pre-contract to post-contract phases of the project life-cycle are illustrated using major projects such as Heathrow Terminal 5, Crossrail and the London 2012 Olympics as case studies. More worked examples, legal cases, case studies and current research have been introduced to cover every aspect of the cost manager’s role. Whole-life costing, value management, and risk management are also addressed, and self-test questions at the end of each chapter support independent learning. This comprehensive book is essential reading for students on surveying and construction management programmes, as well as built environment practitioners with cost or project management responsibilities. Keith Potts is a former Principal Lecturer at the School of Technology, University of Wolverhampton. He was an external examiner in Quantity Surveying and Award Leader of the RICS accredited MSc in Construction Project Management. Nii A Ankrah is a Senior Lecturer at the School of Technology, University of Wolverhampton, UK. He lectures in Quantity Surveying, Commercial Management and Construction Project Management both in the UK and overseas.